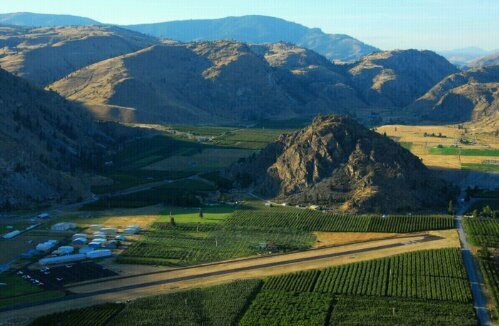 So here’s a snap of Chelan airport, and the pix between will come later ‘cuz no wifi again tonite & posting by cellphone is tedious. Sleepy! When we fly into a small town, people often think we’re rich. Then they ask where we’re from, and modestly replying Santa Barbara seals their mis-impression. So flying into Stanley was a nice change, because people there were somehow taking it all in stride. This morning we woke early and watched sunrise paint the Sawtooths behind our surprisingly cozy teepees. Did you notice the three teepees in yesterday’s pic of our approach to Smiley Creek? You might also notice the two Harleys in this pic, belonging to the sweet couple from Utah who slept on the right with us in the middle and Julie at the left. After a wonderful breakfast of home made granola, the gals made the short drive to Stanley while I flew solo to meet them at the airport there. Being late morning, the air was still fairly cool and with all our camping gear in Julie’s car Tripp was light and frisky. So though there were enough thermals to make for a somewhat bouncy ride, I rode a big one up to 12,500′ for a better look at the mountains and Redfish Lake (Stanley’s in the distance beyond the end of the lake). Of even more interest to me were the zillions of alpine lakes like this, many clearly nestled where glaciers slumbered until a moment ago in geological time. 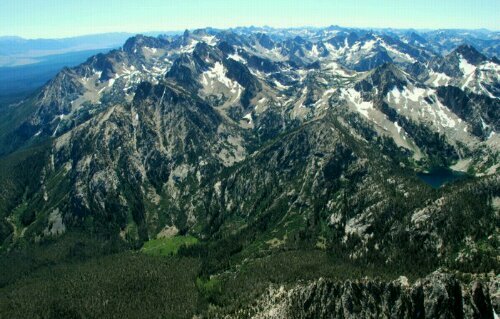 I like the colors amid the gray crags, and the traces of tough trees trying to stretch their march up the mountains. Several lakes had magnificent waterfalls like this next one. We drove together from Stanley out to Redfish Lake where we met Julie’s great friend Suzi, who later took a short scenic flight over the lake with me. Then as the ladies waited at big construction projects on the highway back to Smiley, I flew up the valley enjoying the scenery on both sides yet again on a different route in different light. Solo is fun, but I’m looking forward to sharing it all with Anne again tomorrow.